Rose gold seems to have popped up pretty much everywhere. From rose gold décor and furniture to fashion, to makeup, there’s no escaping this gorgeous shade. In fact, we’re dreaming rose gold dreams of lipstick, eyeshadow, blusher and nail colour… Here’s a roundup of our current rose gold obsessions. SO many eyeshadows, where do you begin? 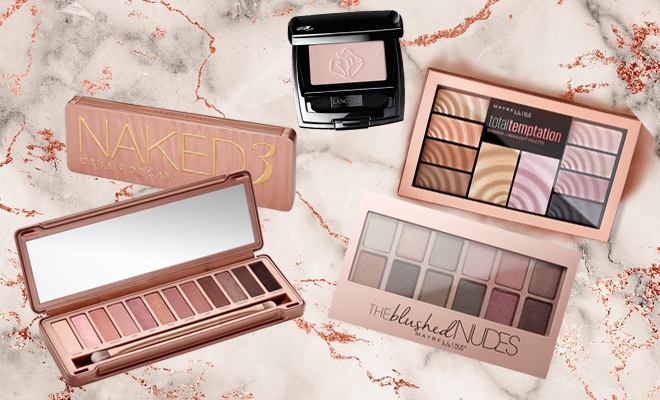 For the ultimate all-in-one rose gold, you can’t go wrong with the Urban Decay Naked 3 Palette (R850.00). Experiment with 12 insanely beautiful rose-hued neutrals in every finish imaginable: ultra-smooth mattes, gorgeous pearls and glimmering metallics. From the palest, shimmery pink to the deepest black matte with red micro-glitter, this palette has us sighing from start to end. If you’re looking for something a little more budget-friendly, Maybelline’s The Blushed Nudes Palette (R260.00) and Total Temptation Eye and Cheek Palette (R299.95) offer great quality shadows in a variety of shades. Plus, the compact palettes are the perfect size to pop in your makeup bag or even handbag. Plus, how dreamy is the texture of the shades in the Total Temptation Palette?! Not much of a palette girl? If you’re going with one shade only, we recommend the Lancôme Ombre Hypnôse Eyeshadow Mono #103 Rose Etoilé (R390.00). It’s soft and romantic, plus it offers a crease-resistant formula with intense pigments and buildable coverage. Yes please! Let’s not forget highlighters – these often have a gold undertone, but these days rose gold illuminators are all the rage. 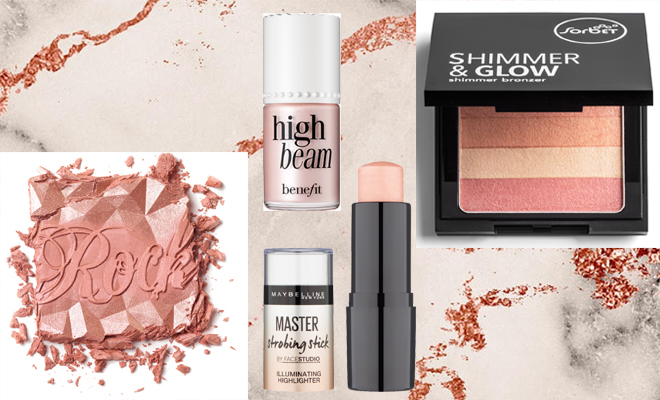 Benefit’s High Beam Luminescent Complexion Enhancer (R385.00) and Maybelline’s Master Strobe Stick (R179.95) will give your skin an intense luminosity with just the right amount of rose gold. We love that these shades work on all skin tones, from fair to ebony. If you prefer powder to a stick, the Benefit Rose Gold Blush (R415.00) and Sorbet Shimmer & Glow Shimmer Bronzer (R200.00) in Just Peachy will be right up your alley. If it were possible to have an entire rose gold makeup tool kit, we’d be there. But for now, we’re just swooning over Tweezerman’s glittery rose gold Tweezers (R250.00) and metallic rose gold Eyelash Curler (R249.00). There truly isn’t a prettier pair when it comes to makeup tools. (Hint – these make gorgeous gifts!). And lastly, where would we be without rose gold nails? 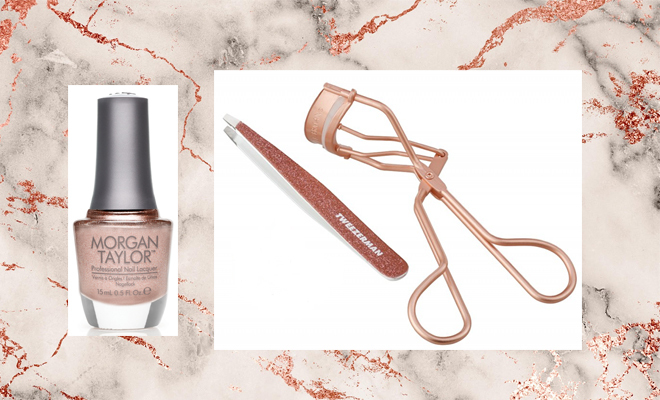 Morgan Taylor’s No Way Rose (R150.00) is the ultimate rose gold nail colour. We love the sparkly finish – it reminds us of the actual metal and once again, it looks great on all skin tones. Do you have a favourite rose gold product we’ve left off the list? Tell us in the comment box below. It’s worth adding The essential Nudes by Catrice. I absolutely love this palette with its warm golds and natural colours. It’s long-lasting and a great steal at only R100! Also, the RIMMEL Magnif’Eyes Multi is amazing! Everyone always complements me when wearing the rosegold shade. This palette has high-shimmer, ultra smooth and blendable formulas that will leave you looking and feeling like a million bucks! NYX Away We Glow Liquid Booster (Love and Light)- Gives an amazing Rosey shimmering look. Great product to add to the rose gold look. The Maybelline strobe stick is beautiful! The maybeline glow stick is to dye for on my skin tone . Rose gold is the new it color specially when it comes to make-up . I think it’s a color that suits most skin tones too and everybody can make it work somehow . i struggle to find the right shade for my skin tone, so i will definitely be trying Maybelline’s Master Strobe Stick. I Love these awesome new shades!!! The Maybelline Blushed Palette is one I am certainly going to get an try. I have tried Maybelline eyeshadows before and I was impressed. I’m most certainly going to give the Maybelline Master Strobe Stick a try.